When I wore this in my China Glaze Crackle Metals post, I realized that I have never posted it before. I've had this polish for so long and I've never posted it! I can't believe that. That's a shame... Ozotic Pro makes amazing duochrome (really, multichrome) polishes that rival the old Sally Hansen Nail Prisms. I hear they do incredible holos as well, but I've never experience them. I wore this not too long ago (three times back-to-back, actually) and decided to take a million pictures of it because it looked so amazing. Despite taking fifty bajillion pictures, I still haven't managed to capture all the colors in this polish. It's awe-inspiring. It goes from teal-turquoise-blue to purple to red to orange-gold-yellow. 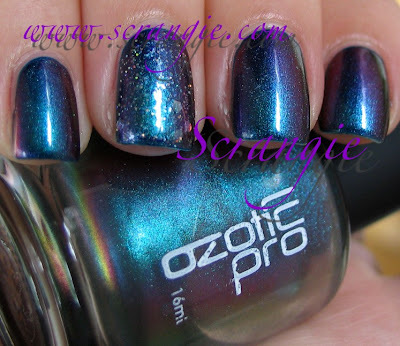 This is Ozotic Pro 505 over Finger Paints Art Of Theft. The ring finger has OPI Servin' Up Sparkle over Art of Theft with 505 layered over it. 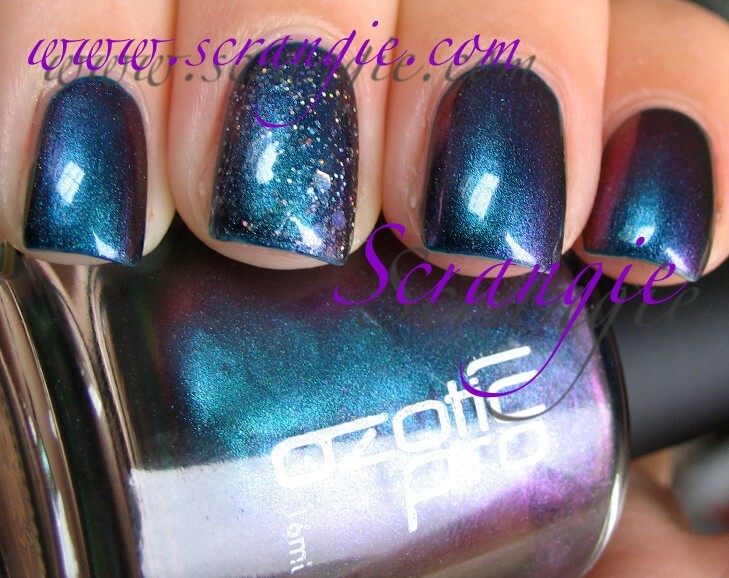 This polish layers amazingly well over glitters, buy the way. It's even better over strong holos. I highly recommend that you try layering a strong duochrome like this over a glitter or a holo. This is an extremely sheer polish so it's difficult to wear alone. 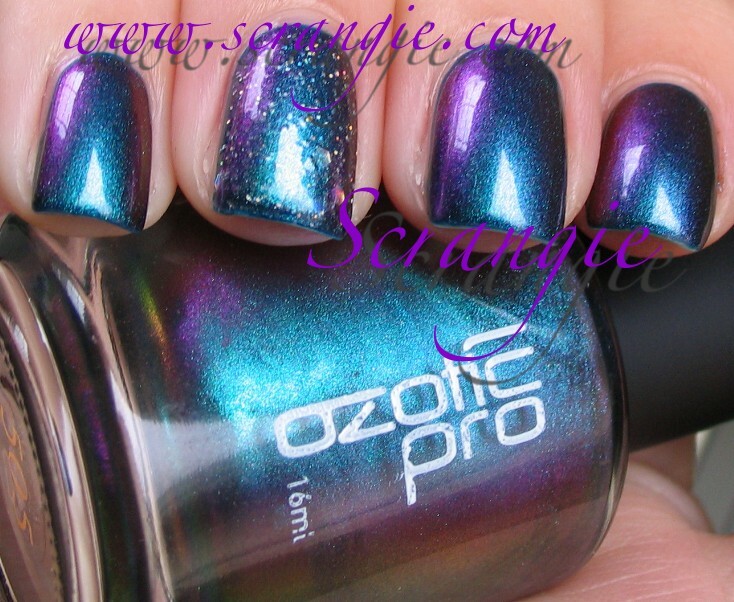 Worn alone, it looks like a crazy duochrome shimmer jelly. It's best to layer it to achieve maximum opacity and duochrome (multichrome) effect and to conserve the polish. These are intentionally blurry- somehow the color shift shows up better when it's blurry... No idea why. These show the beginning of the red/yellow/orange color shift. Can you tell? It's not strong in the photos, but it's obvious in real life. These two pictures with flash show the pretty sparkling teal base that shifts to aqua/turquoise and then immediately to purple. 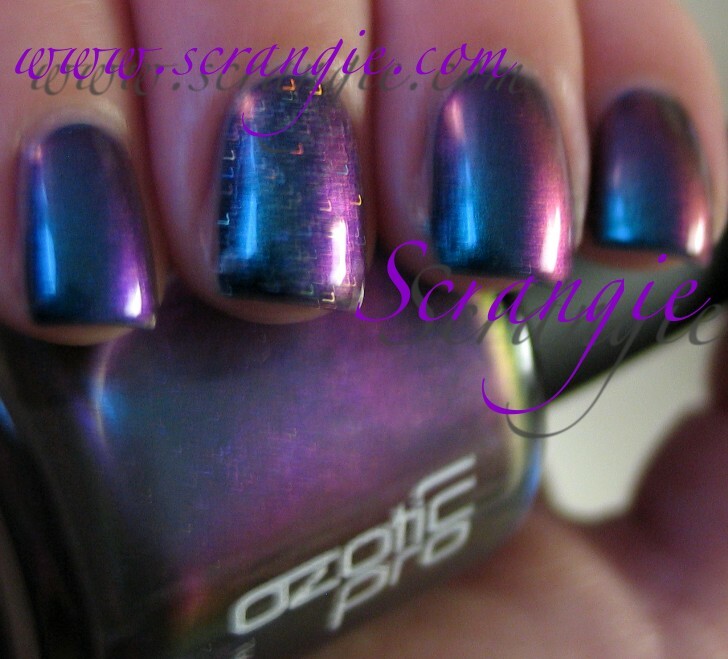 Every time I wear an incredible color-shifting duochrome like this, I wonder why I ever wear anything else. I can't stop looking at my hands and smiling when I have one of these on my nails. Duochromes will always be my number one. I'm not really a green fan that color is undeniable. Thanks for posting. Please follow. This color is AMAZING! Thank you so much for sharing! Do you know where it might be purchased online? OMG I NEED THIS NOW. Gorgeous. Adorei todas as cores e os efeitos. WOW that polish is incredible! It looks great! This brand makes some amazing polishes. I haven't gotten to try them yet, I don't think I can buy them anywhere... Where do you get yours? Online I imagine? *drools* That looks SO awesome. Totally new brand name for me. I have to rush now and Google it to see where it's sold and how much. I am always looking for something that layers well over glitters to make them smooth to the touch. Oooh...found them on line at Picture Perfect. They are from a really small Aussie company that makes them in really small batches and by hand. PP retails them at $14.95/bottle plus tax/shipping. So these are at the pricy end. 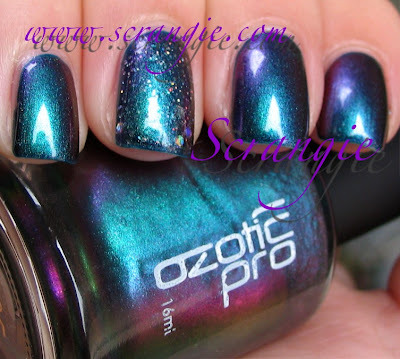 Not too many shades but what's there (esp in the holos) look amazing! Oh, this looks incredible! Need to save up money, though, before I can order this and some of their other colours. :) Love the swatches! cool! It is an amazing color! 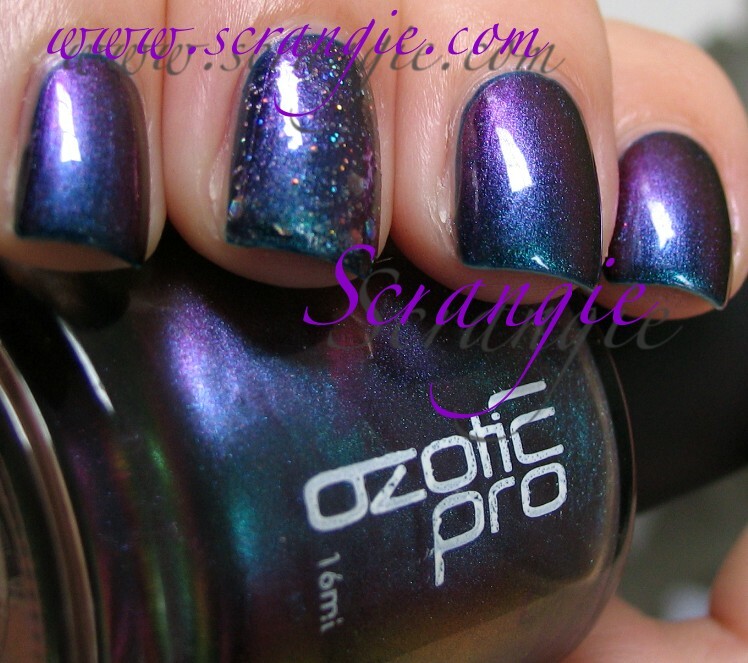 Love the colour and that glitter accent nail looks PERFECT with this mani! You might have some more very soon.